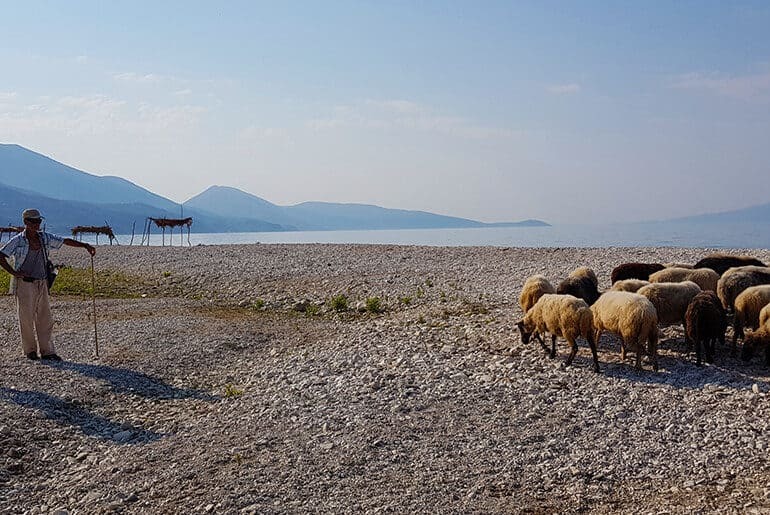 This 4-week itinerary for Albania will take you to the best beaches and the most popular towns, to crazy off the beaten track places and to UNESCO heritage sites. You’ll drive brilliant roads and scary passes, you’ll hike and swim and have the most amazing experiences. 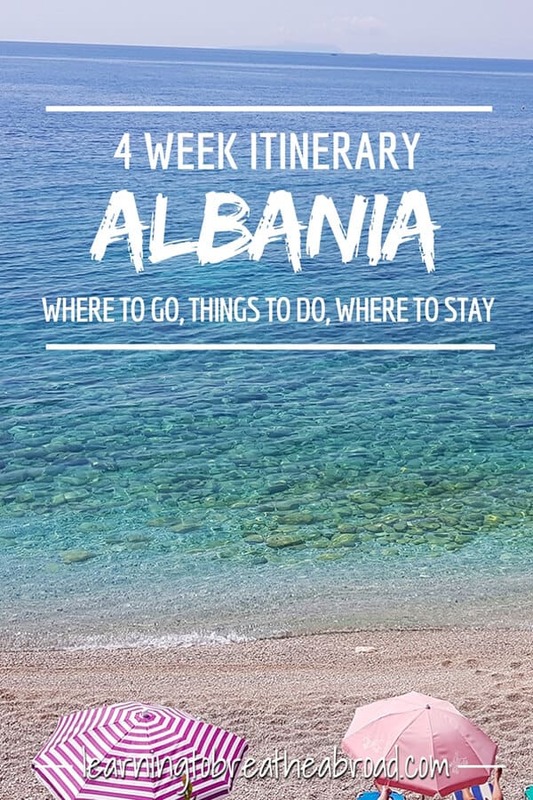 This itinerary is jam-packed with almost everything there is to do in Albania in 4 weeks. 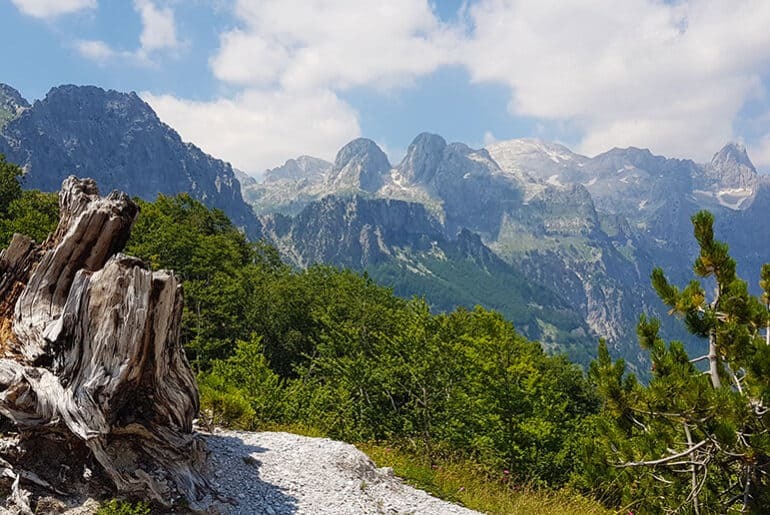 We traveled through Albania in our campervan, Miles McFlattery, from mid-July to mid-August, going from the north to the south and then east to Macedonia. 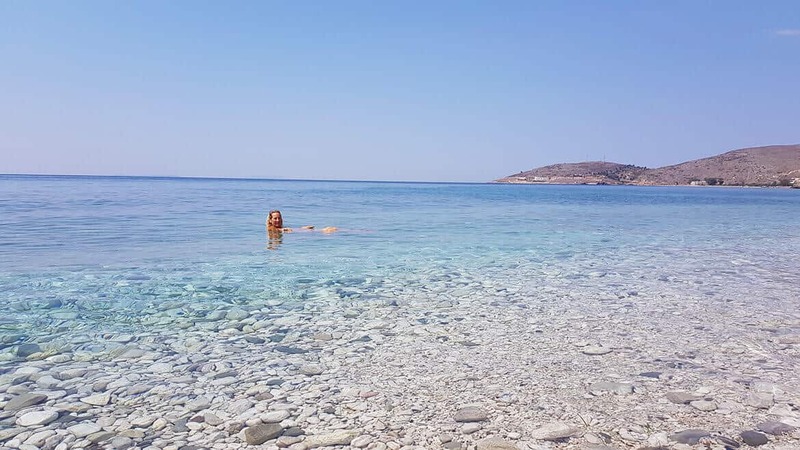 We loved it so much we came back again for the first 2 weeks of September, this time coming in from Greece in the south and heading up to Durres from where we caught a ferry to Italy. 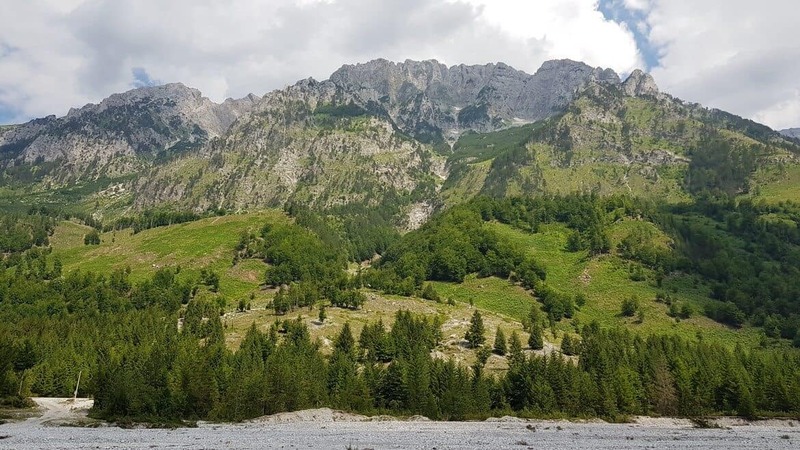 This itinerary is closely based on what we did, although we stayed longer in some places due to work constraints and we revisited a number of places on our second trip. 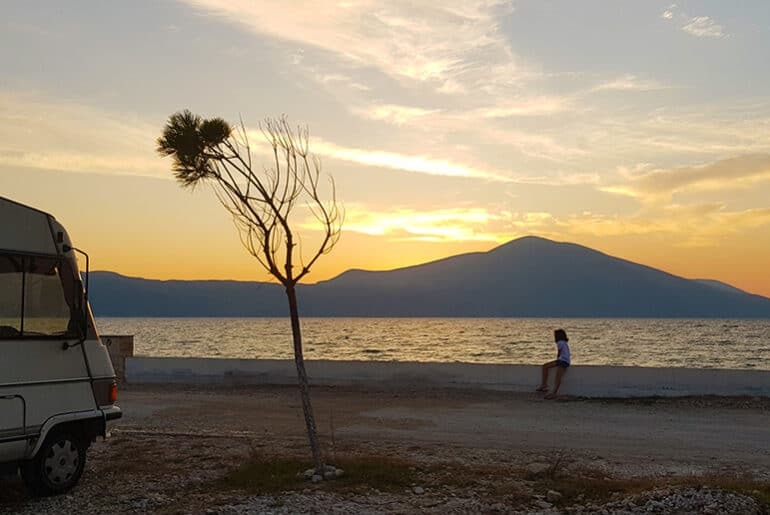 For each day I have outlined what we loved about the place, our favourite things to do and where to stay whether you’re in a campervan, backpacking, or staying in hotels. I have suggested a 31-day trip, but this can easily be adjusted according to the amount of time you have in the country. We aimed for a drive time between each stop of no longer than 2 hours, so that will give you some perspective when planning. 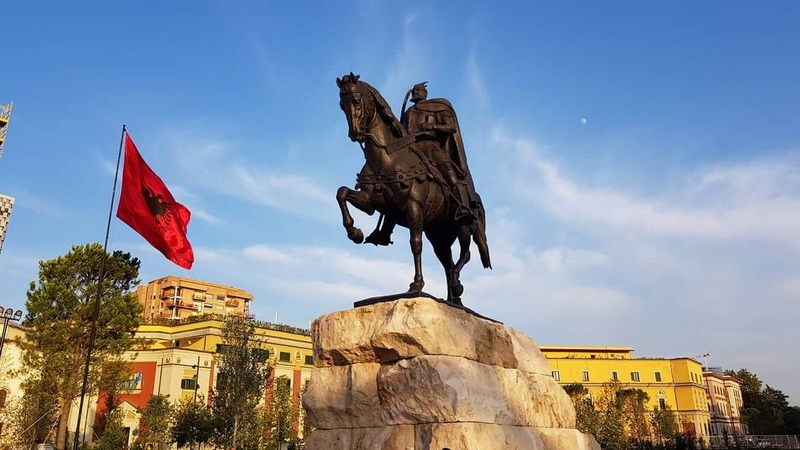 This itinerary can also work as a round trip for those flying into and out of Tirana with an easy road finishing the loop between Pogradec and Tirana. The best way to get around Albania is by self-driving, so if you don’t have a campervan or car, I’d highly recommend that you hire a car. You can find great car hire deals here. The Albanian drivers have a bad reputation but I found them to be better drivers than elsewhere in the Balkans. That being said, it is still advisable to be overly cautious on the roads and keep a good lookout for goats, cows, pigs, sheep and other animals crossing the roads. For the most part, the roads are good, although some parts are rather windy due to the mountainous terrain. There is a good network of buses, although timetables can’t always be relied on. Taxis or furgons, as they are known in Albania, can be found everywhere and will take you anywhere you need for a reasonable fee. Hitchhiking is also widely popular with the backpackers with some advocating it as being the best way to travel. The town of Shkoder has wide avenues and the myriad of bicycles set a slow pace down the main drag. No one is in rush here, so relax with a coffee at a streetside cafe, meander the old streets or grab a bike join the other cyclists. 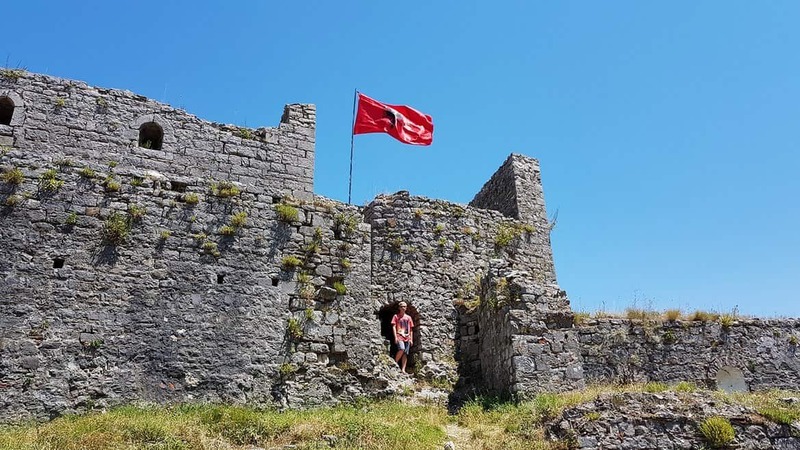 On the hill above town sits the mighty Rozafa Castle with incredible 360 views across the landscape and Lake Shkodra. Lake Shkodra shares its waters with Montenegro and is home to thousands of birds, fish and wildlife, so the ideal place for nature lovers. Lake Shkodra Resort is by far the best campsite in the Balkans. Super clean, a beach on the lake with an excellent restaurant. It also has apartments and a house to rent. Petit Hotel Elita is a modern hotel right in the very heart of the old town, so perfectly located for walking to all the sights. You can organise the various stages of this trip by yourself or do a full organised group tour. We opted for the group tour which included overnights at local homestays and delicious homecooked traditional Albanian food. This trip is one not to be missed! After your hike over the mountain, you’ll need a day to just relax and do absolutely nothing while your legs recover. So another night in Shkoder town or on Lake Shkoder is our recommendation. No sightseeing this time. Just swimming, suntanning, coffe drinking and relaxing! We loved Tirana with its wide avenues and easy to use bicycles lanes. The old Communist-era buildings have all been repainted in bright colours and patterns and there are is art everywhere – on electricity boxes, on walls, in parks – you just have to look. This is a vibrant city with a strong coffee culture. Grab a cup at a streetside cafe and watch the world go by. En-route to Tirana, we stopped at the old town of Kruja. Perched high up on a hill and surrounded by fortified walls, this ancient village is worth a stop. Wander through the Old Bazaar with its Ottoman-style architecture and enjoy the panoramic vistas from the castle. The Jolly City Center Hotel is excellent value for its relatively low price and is perfectly located 5minutes walk from Skaderburg Square. The D1 Hostel is right in the heart of the city offering cheap laundry and a fun communal room. 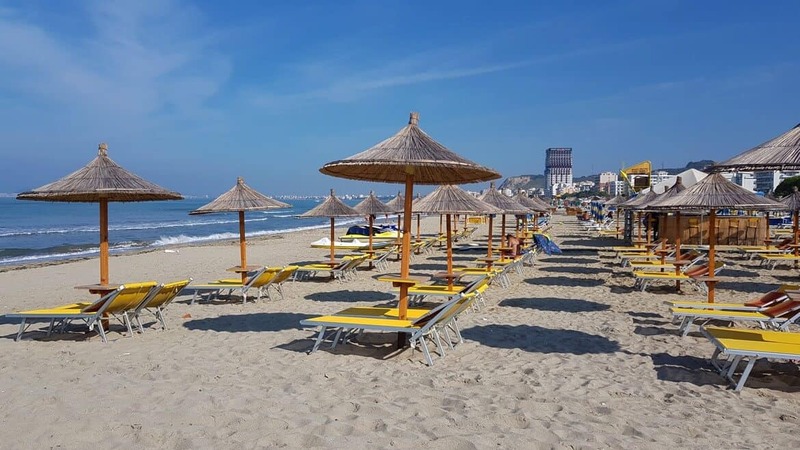 Durres has 10 km of sandy beach that stretches as far as the eye can see. A seafront promenade runs from the centre of town, for about 3km, between the beach a string of hotels. This is the place to be seen in the evenings with hordes of tourists taking sunset strolls amidst bumper cars, souvenir stalls, and candyfloss sellers. 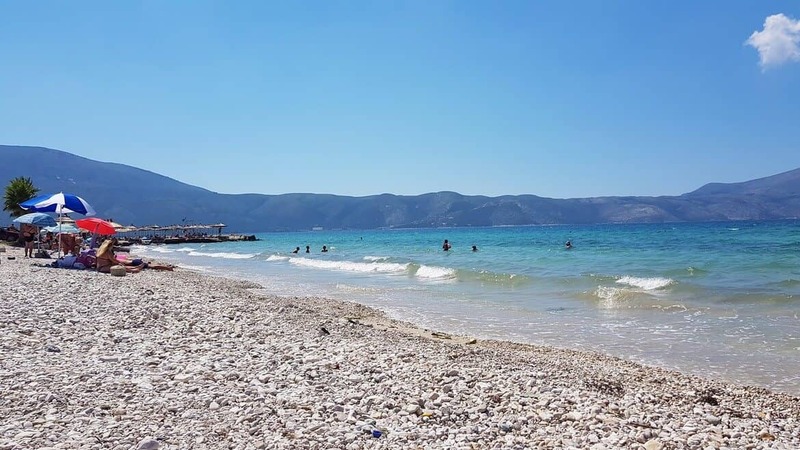 The beach may be long and sandy, but the sea isn’t as crystal clear as the beaches further south, making this our least beautiful beach in Albania. The Premium Beach Hotel is a stunning 5-star hotel at a price that will surprise you! Its a fair way from the centre of Durres, but its right on the beach with a glass conservatory cafe looking over the promenade. This is where I’m staying next time I visit, just stunning! Hostel Durres comes highly recommended with a rooftop terrace and exceptional staff. 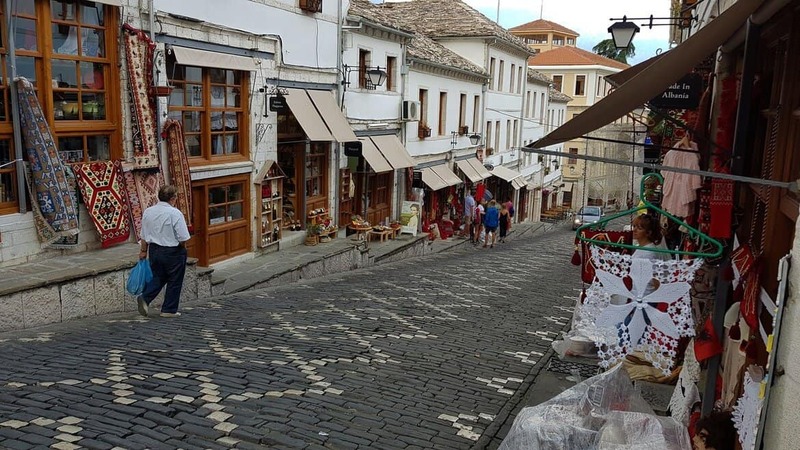 Berat, the City of a Thousand Windows, was charming with its pedestrianised new center and the maze of twisting alleyways in the old town. The walk up to the castle is not for the faint-hearted. We tried riding our bikes up but it was way too steep! I was super envious of those who had driven around the long way to the top in their little cars. Nevertheless, the castle is really amazing. In fact, the neighborhood of Kala is encased within the fortress walls and the houses are still inhabited today. It was definitely, the largest castle we visited, the views from the top were amazing and the fruit sellers with 1€ punnets of berries were a godsend in the heat. Where better to stay but in the 300-year-old Hotel Klea right inside the fortress! You’ll have the added bonus of seeing the fortress at night. Villa Juri is a family run guesthouse and campervan stop. The cooked us a traditional Albanian meal I’m still dreaming about. Narte Beach is a few kilometers north of the city of Vlores. 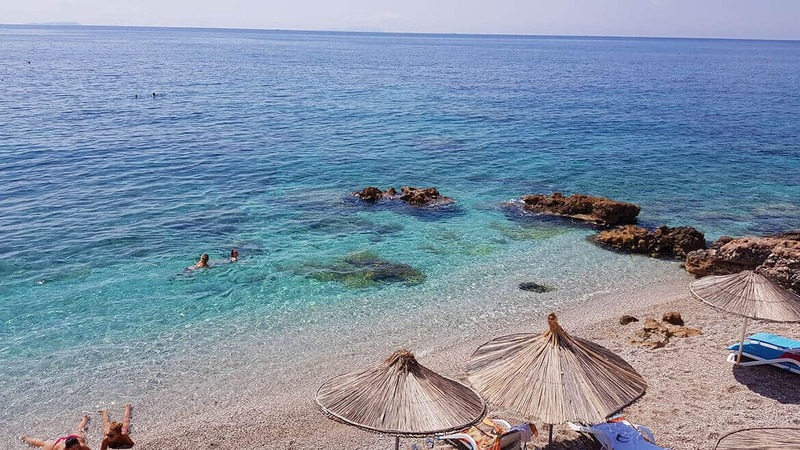 Vlore is the third largest city in Albania and although it has its own beach, its not the nicest beach, which is why we recommend Narte Beach instead. Narte is a lovely sandy beach with restaurants dotting the beachfront and a row of pine trees offering shade should you be in a campervan. If you are in a campervan, I’d highly recommend spending the night in the Narte Nature Reserve just a few more kilometers up the road. If you’re in a car then its also worth a quick trip to see the amazing birdlife and the huge flock of flamingos. Orikum is a little seaside village with pebble beaches and hardly any tourists. We wild camped alongside the beach and had delicious meals at Hotel Alba-Gert. A big bowl of mussels and a beer for 7€ – now that’s a win! There is not much to do in Orikum other than relax on the beach, which I’m sure you’ll need to do after all the sightseeing you’ve done so far! The next stretch to Dhermi will take you over the Lagora Pass, listed as one of the most dangerous roads in the world. The first time we went over in the campervan, it was really scary, but the second time we came from Dhermi to Orikum and it definitely wasn’t as bad. Perhaps I knew what to expect the second time around or maybe it just easier going from south to north? Dhermi is the French Riviera of Albania. One very long stretch of stunning beach running off to the south with a promenade and a splattering of restaurants and cafes. But the best part about Dhermi for us was the tiny little beaches below the cliffs of the town. Only 10 sunbeds per beach, so we felt like we had it all to ourselves. Oh and the water!! All the hues of blues you can imagine from turquoise to midnight blue. Sitting at the restaurants on the cliffs above the beaches, looking out over the azure sea, we felt like we’d died and gone to heaven. Dhermi is set on a steep hill, so being close to the beach is important. The Mehilli Hotel has a great location at a reasonable price. Apartment Sea Side is a big and light self-catering apartment that comes highly recommended. The owner is incredibly hospitable and it is also located right near the beach. 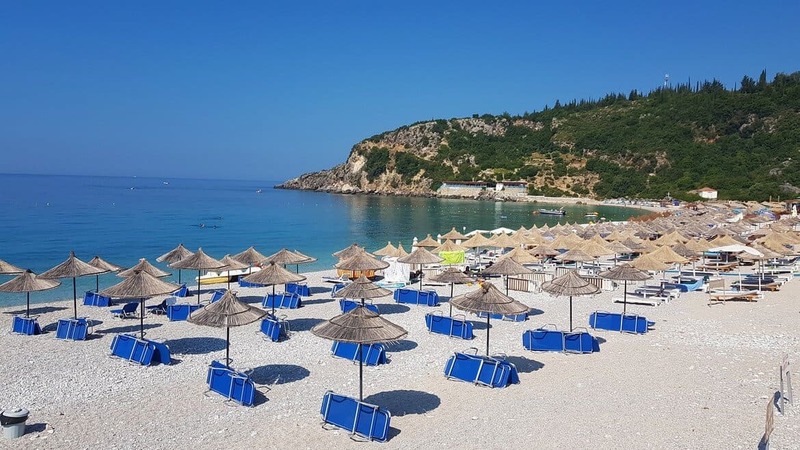 Himare has a fabulous beach, but in high season the town can be noisy and overcrowded with tourists, which is why we chose to stay at the very nearby lovely Livahdi Beach. Livadhi Beach is absolutely stunning and even in season, it is still relaxing and wonderful. We even got to park our campervan right on the beach! For the ultimate beach holiday, we recommend Scala Bungalows right on Livadhi Beach. Fabulous terrace with sea views, wifi and the owner will even cook you a Greek breakfast if you ask. Borsch beach was our most favourite place in Albania! Borsch beach is actually 7km long and the south end is a popular destination with lots of hotels, restaurants and beach bars. The northern end is still untouched and is often referred to as “Wild Beach”. This is where us campervanners love to stay. Nothing around bar the sea, a freshwater stream and nature. Besides that is all the pigs, goats, cows and sheep that stroll past to have a drink on the little river. You don’t get to feel freer than in this very beautiful tranquil spot. 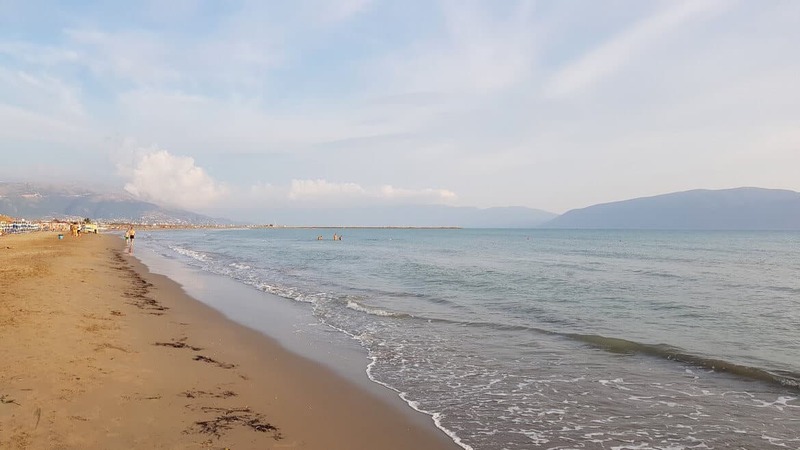 Our recommendation would be to stay right on the beach in a campervan, but if that’s not an option then you can find the latest accommodation deals for Borsh here. 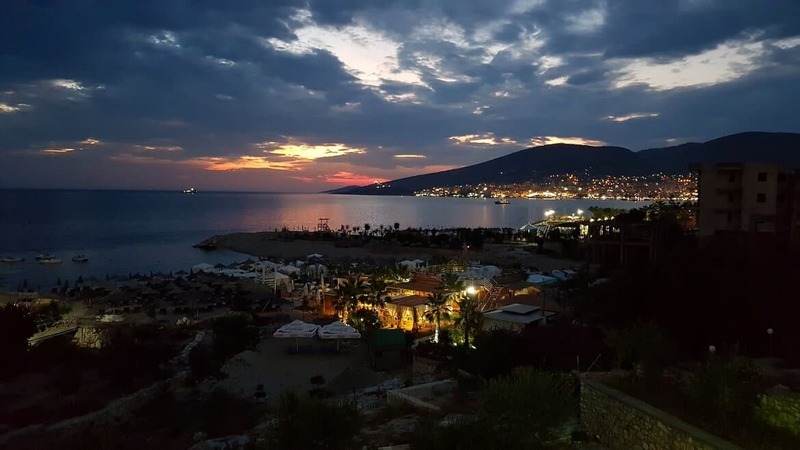 Saranda has lovely beaches, a thriving nightlife and fabulous restaurants, which is why local and international tourists flock to its shores every summer. The aquamarine waters and inexpensive prices make Saranda the optimal place for an affordable holiday. The busy city setting isn’t for everyone, but it is an ideal location from which to explore the local beaches and doing day trip to see some incredible sights. Hotel Piccolina overlooks a sensational little beach and only a 10-minute walk into the centre of town. Overlooking its own private beach with complimentary sunbeds for guest, Hotel Villa Visad is a fabulous place to stay. Ksamil is the hidden gem of the Albanian Riviera. Dazzling white sand beaches, crystal clear water, delicious seafood and all at a fraction of the cost of Corfu, only a stone’s throw away. In fact, it was seeing a photo of Ksamil on a friend’s Facebook page that was the catalyst for our entire Eastern European campervan trip. 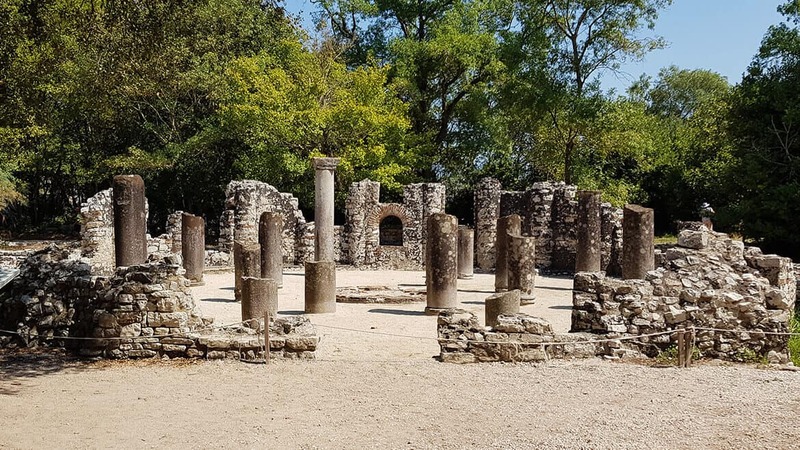 Arriving in this tiny town within the Butrint National Park, we were not disappointed. The water really was the colour I’d seen in the photos and with numerous bays and beaches to choose from we were in heaven. Ksamil is now firmly on the tourist radar with people flocking here in July and August. Being so far south it has a mild Mediterranean climate so you can still enjoy the beaches out of season. 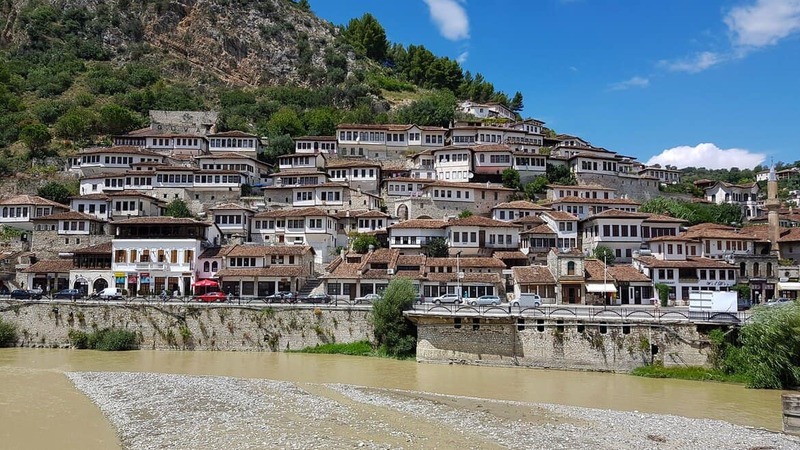 A UNESCO World Heritage Site, the ancient town of Gjirokaster has stood the test of time for the last 2500 years. Famous for its old neighborhoods preserving historic Ottoman-era architectures and the magnificent castle looming over the town from high up on the hill. Climb up to the fortress for a panoramic view across the slate-roofed houses of Gjirokaster and the spectacular Drina Valley below. The route from Ksamil takes you over a winding pass, full of switchbacks and a rather deadly drop down the side once you crest the top of the mountain. The road is good though, so not a difficult drive. Make sure to stop at the Syri I Kalter (Blue Eye) en-route. 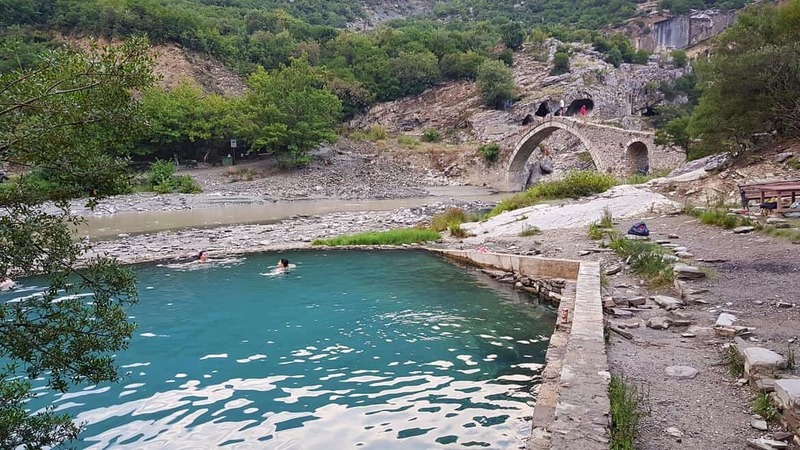 Its the most touristy place we found in all of Albania, but the spring is a natural wonder and well worth the stop to see the incredible colour of the water as it changes from emerald green to hues of blue. Take a step back in time the Old Bazaar 1790 hotel, where you get to enjoy a truly authentic experience in one of the old Ottoman-style houses, decorated in traditional Albanian style. It is also perfectly located in the Old Bazaar. Permet is a tiny town. A quick blink and you’re out the other side. Its stunning natural landscape of hills, forests and rivers is fast making it a hub for outdoor adventure with canyoning, rafting and recuperating in the thermal pools being just some of the activities you can enjoy. Just 15km from Permet, you’ll find the turnoff for the Langarica Canyon and the Benja Thermal Springs. The sulphuric waters of these natural pools are particularly beneficial for curing gastric and rheumatic diseases. Covering your face and body in the black mud will leave your skin feeling like a baby’s bottom! If you’re in a campervan, there is ample place to park right next to the river for a nominal fee of 200 Lek. Our recommendation is the Funky Guest House & Bar. Exceptionally reasonable and a great location in the heart of the village. The road from Permet to Pogradec via Korce was the most challenging drive in all of Albania, with lots of hairpin bends up and down passes, through forests and over potholed roads. The landscape was stunning though and we stopped to take photos often! 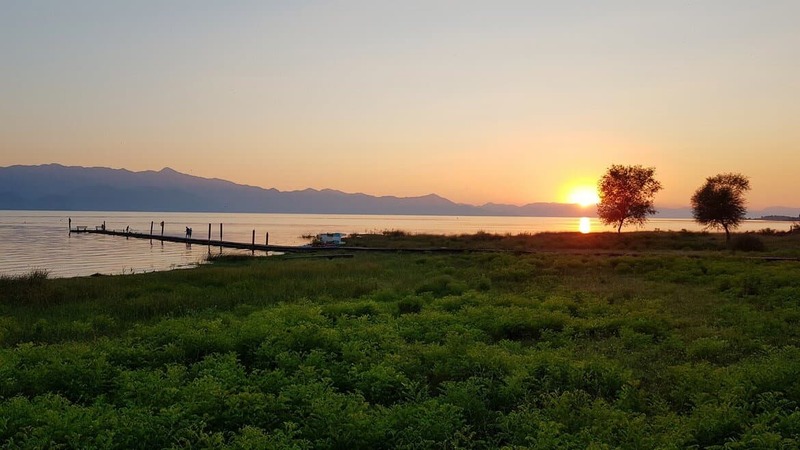 The hues of the water and sky on Lake Ohrid will mesmerize you by day and astound you at sunset. 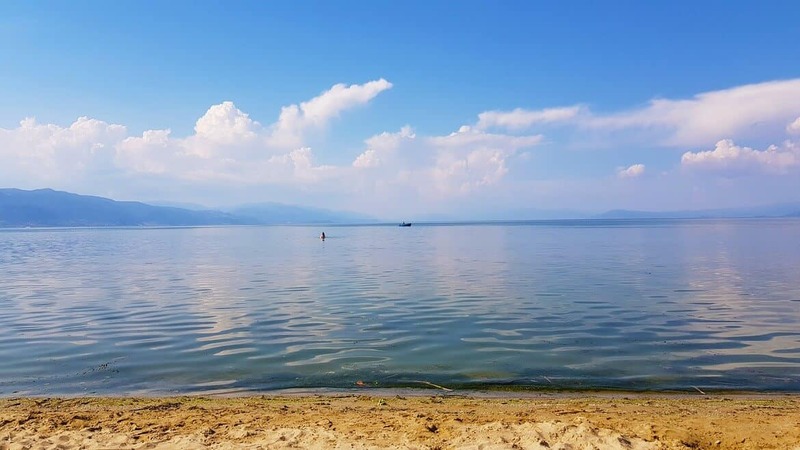 The town of Pogradec lies on the shores of Lake Ohrid with a vast array of hotels, cafes and restaurants catering to all tastes. The town itself isn’t very remarkable, but the beauty of Lake Ohrid makes up for that. Numerous beaches line the shore and sunbeds and inflatables abound. It is peaceful here and the perfect place to unwind after a busy travel schedule. Hotel Pogradeci is located right on the shore of Lake Ohrid in the heart of Pogradec town. It offers big balconies and a private beach with sun loungers. A 5-minute drive from the city centre in the town of Tushemisht and located at the Drilon Spring is Vila Dante Boutique Hotel. Have you been to Albania? Are there any places you think should be added to this Albanian itinerary? Let me know! Fantastic blog! Your information is so unbelievably helpful. We are definitely looking into a trip to Albania and will closely follow your wonderful advice. THANK YOU! Thanks for the great feedback! I love being able to share information on these lesser known places that are so well worth visiting! Never thought of visiting Albania before, but this looks so beautiful! It’s cheap. Its beautiful. It has some of the best beaches in Europe and the people are wonderful. I cant rate Albania highly enough!